Ready to roll: The disassembly of NASA's original Shuttle Carrier Aircraft has been completed in preparation for its move to Space Center Houston in late April 2014 for public display. HOUSTON — A historic NASA jumbo jet has been cleared for its final takeoff — not into the air, but on a road trip through the streets of Houston to the site of its future exhibit. 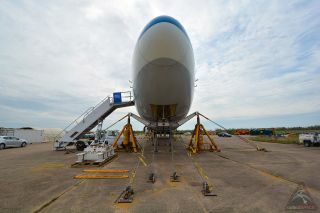 To enable its transport, Boeing's Aircraft on Ground (AOG) team partially disassembled the jet, removing its vertical stabilizer (or tail), aft section, engine mounts, and landing gear. The engineers also removed the jet's wings, marking the first time in history that the Boeing team separated a 747 from its wings outside of an aircraft hangar. The work to take apart the SCA, which is also referred to by its tail number N905NA, or NASA 905 for short, began in mid-February and was finished Wednesday (March 26). The SCA's fuselage, wings, aft section and other parts will next be loaded on to flatbed transports and trucks for the trip to Space Center Houston. "To minimize the impact on traffic and local businesses, the move will occur over two nights starting at 9:00 p.m. [CDT]," the center's officials said. Details of the move and where the public can view it as it happens will be announced soon, but the general plan is to traverse the 8 miles (13 kilometers) over the course of two legs. On the first night, the convoy will travel from Ellington on Texas State Highway 3 to a staging area on E. Commerce Street, where the aircraft will spend the day (April 29). As night falls, the SCA will continue its trip to Space Center Houston, traveling along NASA Parkway (NASA Road 1). "The convoy is then expected to arrive early Wednesday morning [April 30]," Space Center Houston officials said. Once in place, work will commence to reassemble NASA 905 and prepare it for being mounted with a full-size, high-fidelity mockup of the space shuttle. Together, the aircraft and the orbiter "Independence" will form the centerpiece of a new $12 million, six-story public attraction set to open in March 2015. The "Shuttle and 747 Carrier" exhibit will offer visitors the unique chance to tour inside the SCA and the orbiter atop it. Space Center Houston plans to outfit the jet with state-of-the-art exhibits with a focus on educating the students and the public about the legacy of the space shuttle. Click through to collectSPACE for a map showing the route the Shuttle Carrier Aircraft will take between Ellington Field and Space Center Houston.